Over the past 12-15 months, the government has taken a number of initiatives to increase gas consumption in the country, in order to transition to a gas-based economy. This new direction in the country’s energy landscape is well-aligned with its commitments made at the Conference of Parties held in October 2016. The development of the city gas distribution (CGD) network is one of the cornerstones of India’s strategy to transition to a low-carbon economy. On the policy front, changes have been made with regard to the pricing of domestic gas produced in difficult geographies to incentivise players to commence local production of the fuel. The Union Budget 2017-18 has also reiterated the government’s intent through the proposed cut in the custom duty imposed on imported liquefied natural gas (LNG). Meanwhile, works related to pipeline development are progressing well. While these have been the key developments on the macro level, the government is taking initiatives on the micro/household level as well to promote greater use of the fuel. On the end-user front, the government is encouraging citizens to use gas for fuelling their vehicles as well as for domestic purposes. 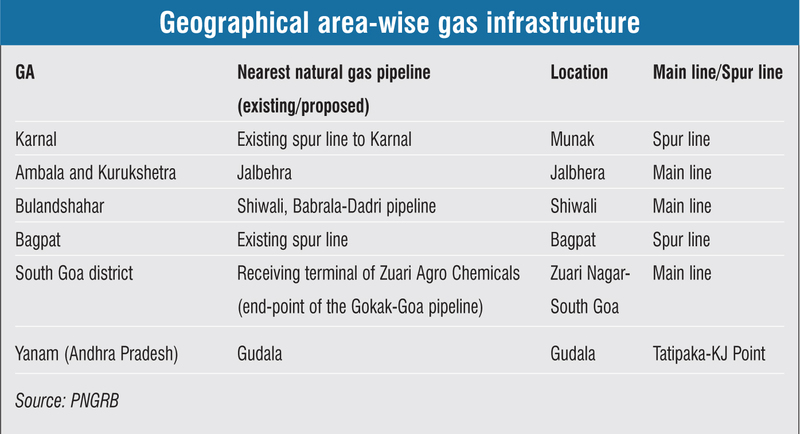 For the development of the CGD network, the Petroleum and Natural Gas Regulatory Board (PNGRB) has recently undertaken the eighth bidding round in seven geographical areas (GAs) across Haryana, Goa, Puducherry, Uttar Pradesh and Maharashtra. Bids were invited on December 26, 2016 and the last date for the submission of bids was February 16, 2017. In the current regime, CGD licences are awarded through competitive bidding, wherein bidders submit bids, based on technical and financial considerations. Amendments are made to the bidding criteria from time to time, amendments, resulting in a change in the licensing regime over the years. For selecting the lowest bidder, 70 per cent weightage is accorded to the lowest present value of the overall unit network tariff (Rs per million British thermal units) over the economic life of the network project (25 years) and 30 per cent weightage is accorded to the lowest present value of the compression charge (Rs per kg) for dispensing compressed natural gas (CNG) at CNG stations. The PNGRB is playing a key role in increasing CGD penetration in India. In 2016, the regulator announced its target to increase CGD penetration in 240 cities across 67 GAs by 2022. To this end, it needs to offer commercially feasible GAs for bidding, ensure judicious implementation of regulations and timely monitoring of authorised GAs, and take suitable action against defaulters. The future of the natural gas market in India looks bright and the share of natural gas is likely to increase from the current 7 per cent of the energy mix in the country. This can be achieved only by increasing domestic gas production, sourcing cheaper gas from the international market, developing LNG terminals and re-gasification infrastructure, building a national gas grid and optimising pipeline capacity utilisation from the current level of about 40 per cent.